OREGON CITY — Things couldn't have gone much better for the Tualatin High School cross country teams at the Three Rivers League district meet. Timberwolf senior Andrew Payton, with a gutsy, come-from-behind performance, ran to victory in the varsity boys race. 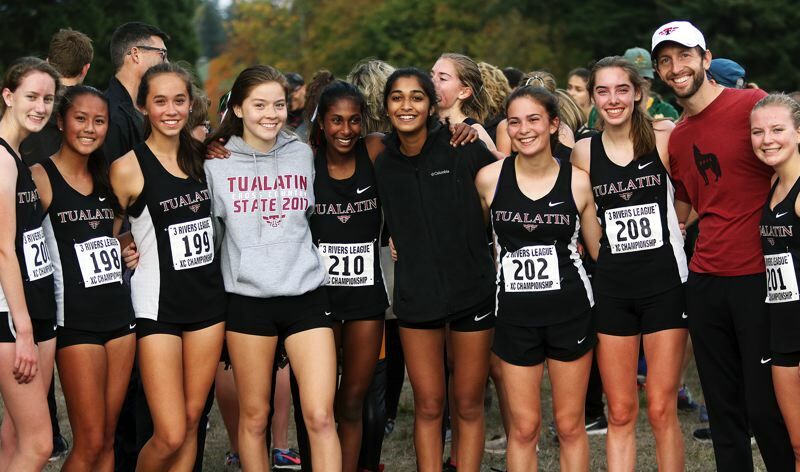 The Tualatin girls squad, led by junior Kaitlyn Gearin's second-place finish, showed its depth, strength and power. And, oh yeah, both Timberwolf squads are now going to the Class 6A state championships. 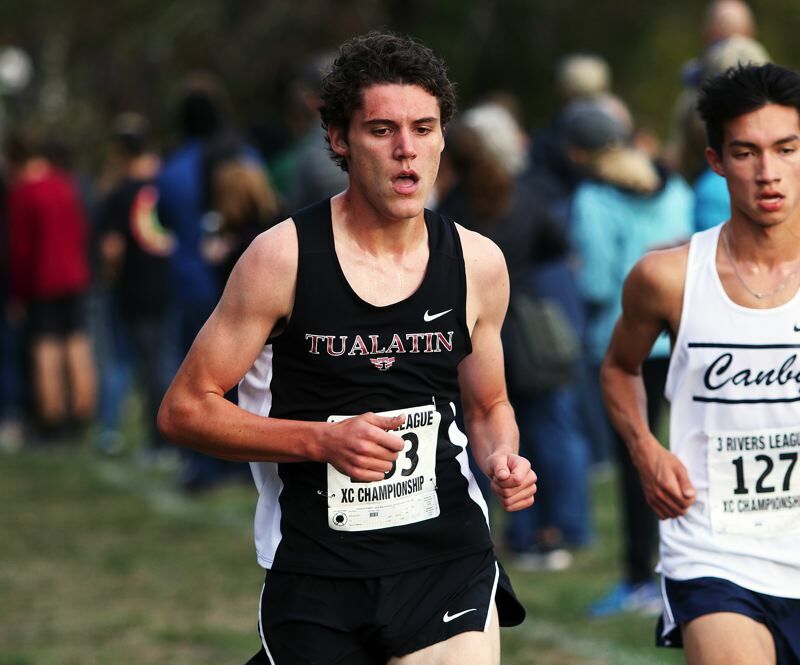 Yes, it was a good day for Tualatin at the TRL district meet, held Oct. 24 at Clackamas Community College. "It means a lot," Payton said of the district title. "The last two years, I finished behind my teammate Adam Klein. Once he left, I knew it was my turn. I kept that in my mind, stepped up, and hard work paid off." 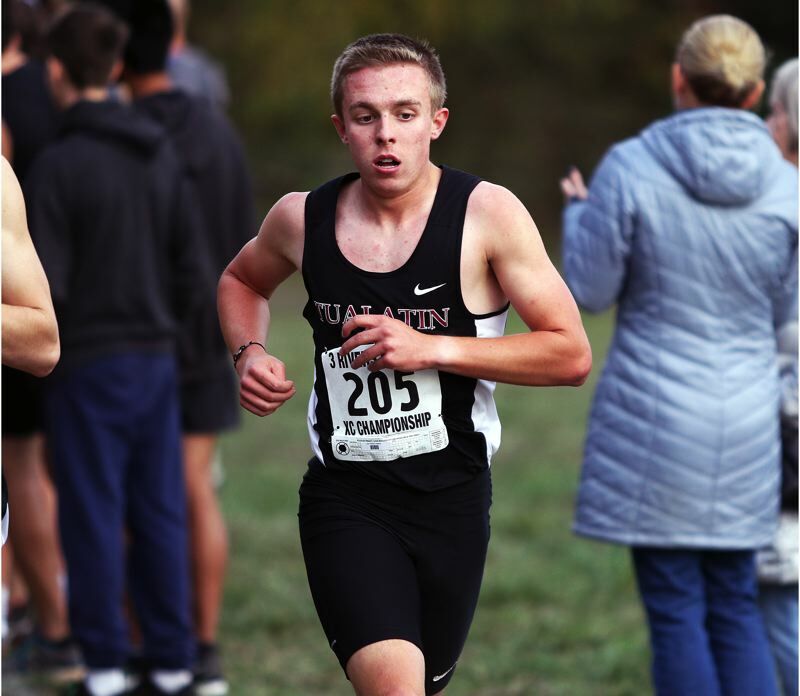 Up next for Payton, as well as his teammates on the Tualatin boys team as well as the Tualatin girls team, will be the Class 6A state championships. "I think we still have more in us, so I'm excited to see how state goes," Gearin said. "Maybe we can take another step up." Payton sure stepped up at the Three Rivers League district meet. He ended up dueling with West Linn senior Kenney McElroy throughout the race. "After the last race we had, I knew he'd be a main competitor here," Payton said. "I knew it would be he and I, and I took it out pretty good, and then let him do some pulling, and drafted off him, and, at the end, I just took off. I used the momentum from the top of the hill and never looked back." 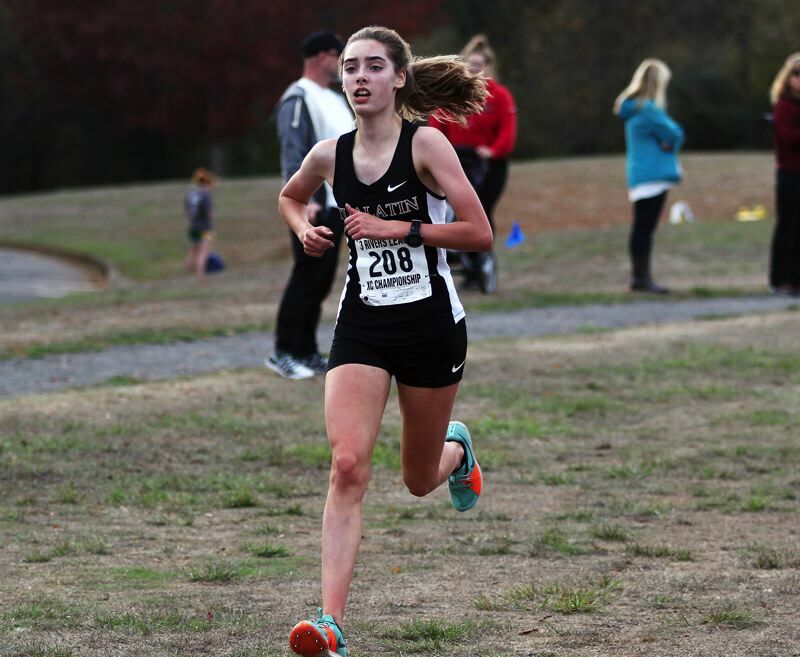 Payton, pulling away from McElroy over the last 400 meters, ended up with the race, and the district championship, in a time of 15 minutes, 56.28 seconds for the 5,000-meter course. "It felt very relieving," Payton said about crossing the finish line in first place. "The race overall felt pretty tough. I knew that Kenney was a kicker, not like any other, so I knew it was going to be gutsy. The first time I made a pass, he made a counter, and then I made another counter. There was a lot of pain, and it all came down to guts." Payton is now taking high hopes to Saturday's state event. "My goal is to finish in the top five," he said. "That would be a good goal. It's going to take another solid week of training, also just a lot of rest. I need to make sure I feel fresh. In the actual race, I'm going to try and surround myself with the top guys, and make myself part of the pack." Also for the Tualatin boys at district, junior Ethan Klein was 13th at 16:56.07, freshman Sam Roach was 23rd at 17:19.73, senior Graehm Alberty was 25th at 17:27.32, junior Sam Smith was 26th at 17:30.17, senior Alex Pegis was 29th at 17:41.35 and junior Andrew McDade was 32nd at 17:51.70. The Tualatin boys finished third in the team standings with 88 points, putting the Wolves four points behind second-place Oregon City and just one point ahead of fourth-place Canby. The Tualatin girls took second place at the district meet with a score of 48. That put the Wolves behind only St. Mary's Academy, which had a score of 30. "I'm really happy with the team," Gearin said. "(Freshman) Mahathi (Sridhar) really stepped up and had a good race. We really wanted to come together as a team for one of our last races of the season. We wanted to step up and make an impact." 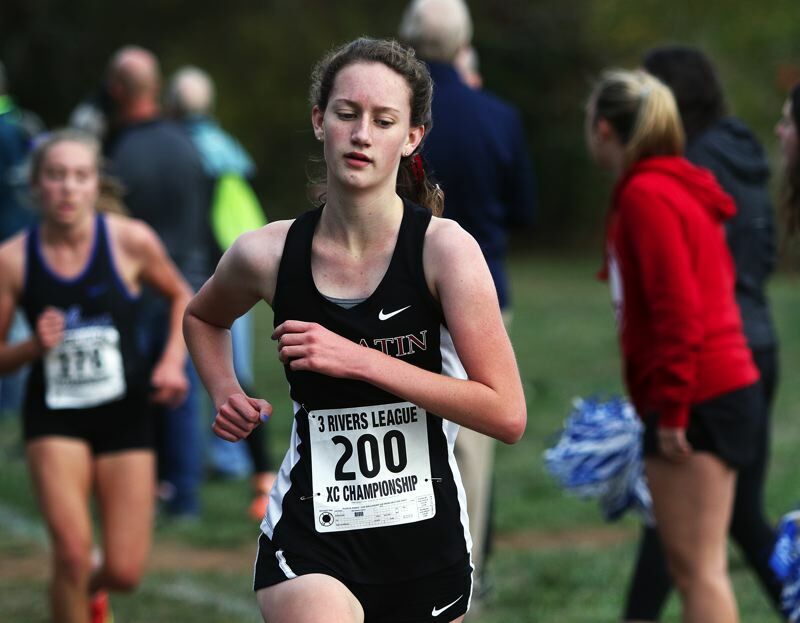 Gearin certainly made an impact for Tualatin at district, as she ran to second place in a personal-best time of 18:23.50. That put her behind only St. Mary's sophomore Fiona Lenth, who won in 18:07.39. "I'm really happy with it," Gearin said. "I pushed myself. It was a battle. We really pushed each other and paced off each other. That really helped a lot." 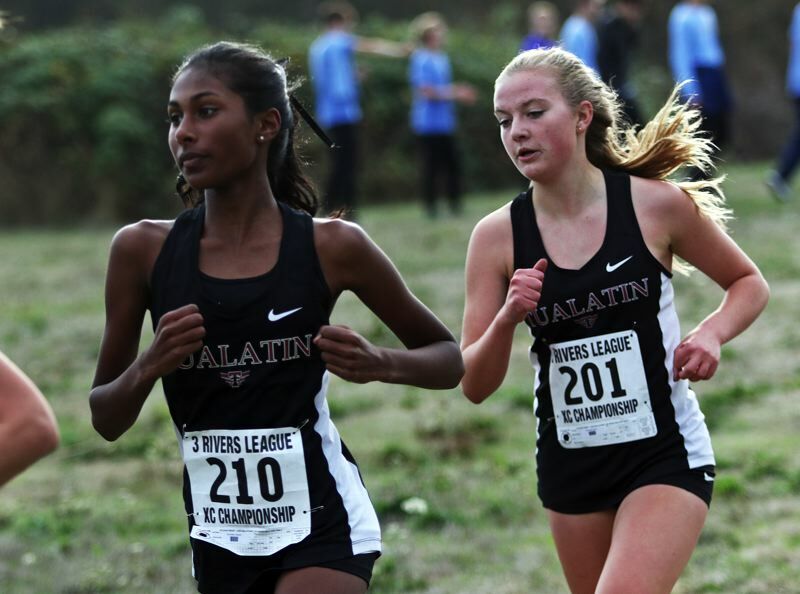 Also for the Tualatin girls, sophomore Olivia Seits placed sixth in a time of 19:07.83, Sridhar was ninth at 19:36.61, senior Sarah Hanson was 14th at 20:06.47, sophomore Lily Hughes was 17th at 20:22.24, freshman Naiya Gates was 18th at 20:23.91 and junior Taylor Cockrell was 19th at 20:36.05.